Capt. 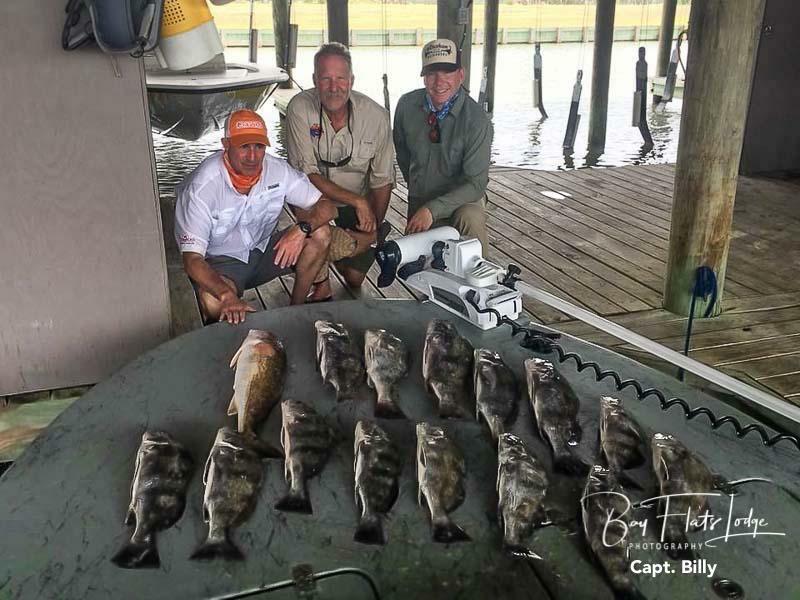 ‘Lil John Wyatt – Everyone had a good time this morning out on the water. Today finished up two good days with this group from the Jared L. party. We had to work for the fish yesterday and today, but these guys were able to put fish in the box each day, plus they got to take plenty home for later. They were all-around happy customers! Capt. 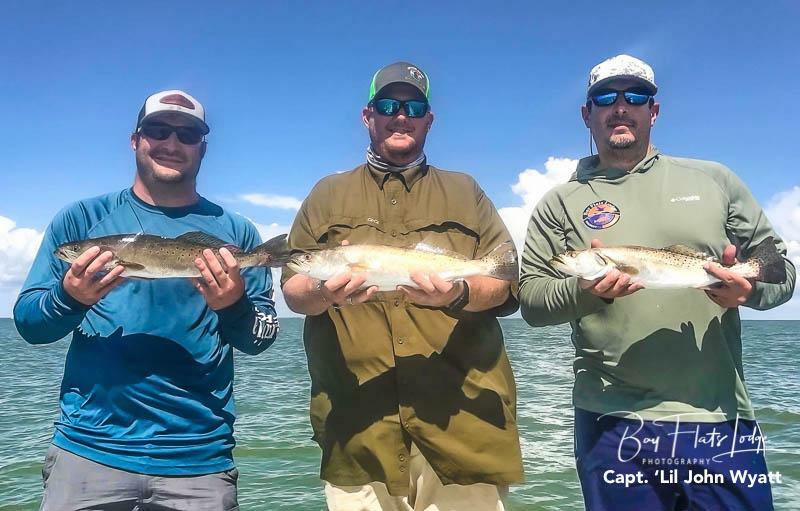 Kevin Matula – Today’s party of three told me ahead of time they were not going to leave Seadrift without their limits, so what else could I do but try me very best to put them on as many fish as I could possibly find. 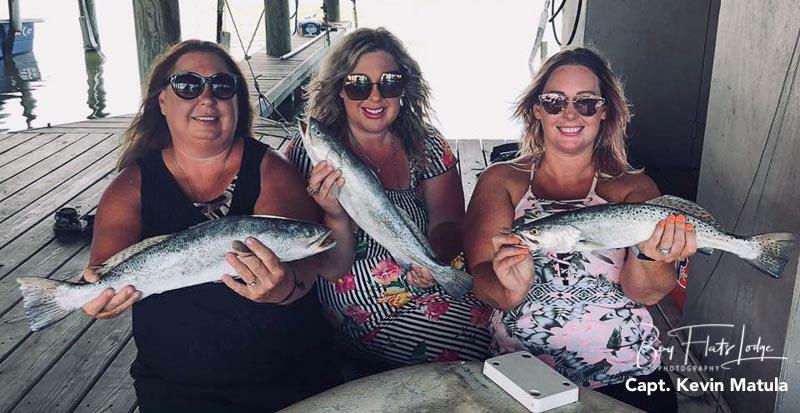 I had a good time fishing with these ladies – from catching fish to getting drenched from thunderstorms, there was never a dull moment on this trip. Everyone had lots of laughs and lots of fun! Capt. 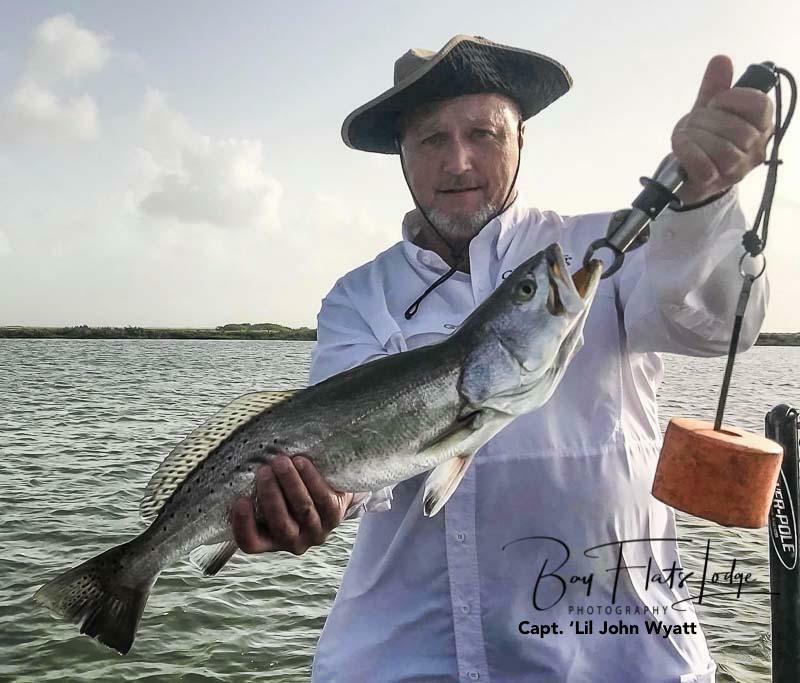 ‘Lil John Wyatt – When the wind is howling from the south and the conditions aren’t very favorable for catching fish, you rely heavily upon your professional fishing guide to get the job done. Hopefully, he’ll have a solution to the problem! But today I really didn’t have to perform any miracles, as I had good anglers onboard, along with a good friend that I’ve known for a long time. Don’t get me wrong, we had to work hard to put today’s fish in the box, but it was a great trip! Capt. 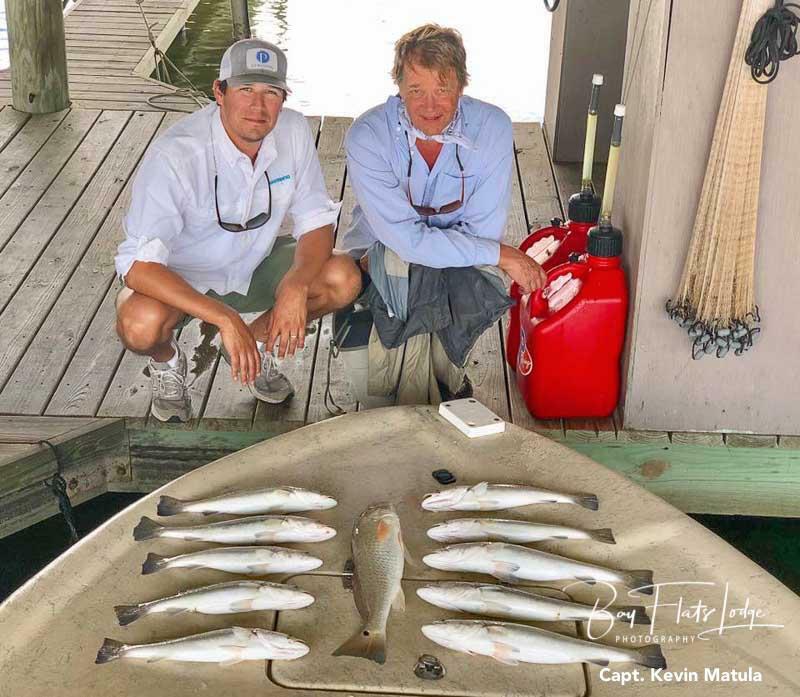 Doug Russell – Today’s crew of four finished the day strong with 18 speckled trout and one bonus redfish. It was a fun day and everyone seemed to enjoy their time out on the water, and their time away from everything else! Capt. Kevin Matula – We had a great trip today with a father-n-son team who really enjoyed fishing. 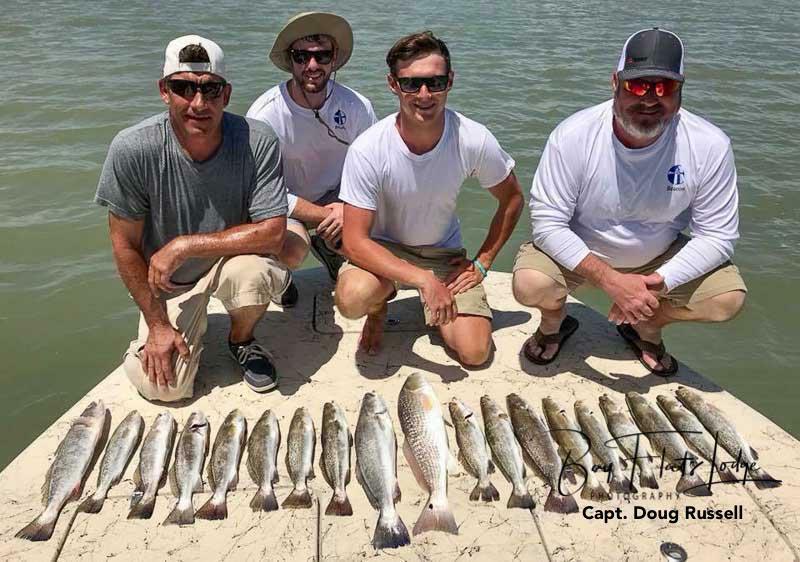 They managed their two-man trout limit, as well as a fantastic redfish to top things off. It’s truly a pleasure to witness the memories that are made as a result of family members spending time together out on the water. Things just don’t get much better than that! Capt. 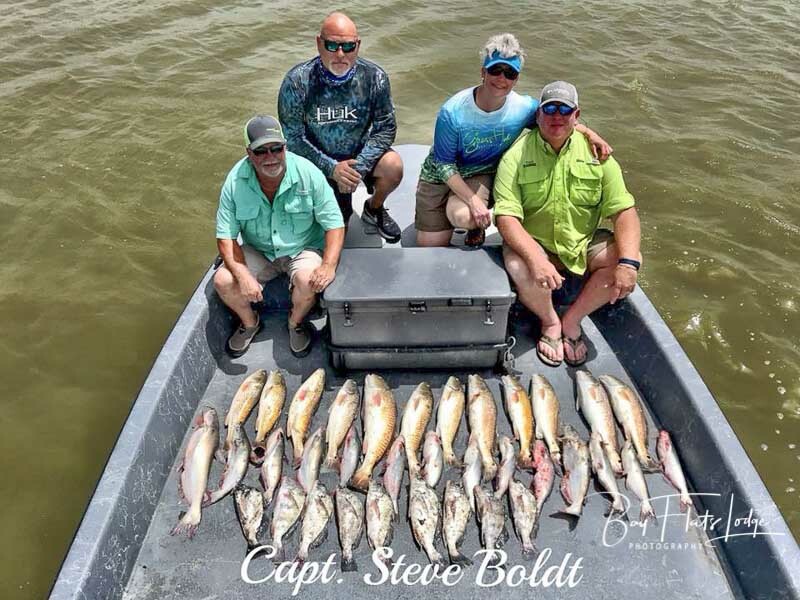 Steve Boldt – Saturday was Day #1 with the Billy M. party of four, and it proved to be a true grind of a day. We weren’t real sure what was going on with the fish (or the lack thereof), but the team pulled things together enough to put about a half-dozen trout in the box by the end of the day. Today was Day #2, and I had to call a big audible after the poor showing of trout on Saturday. 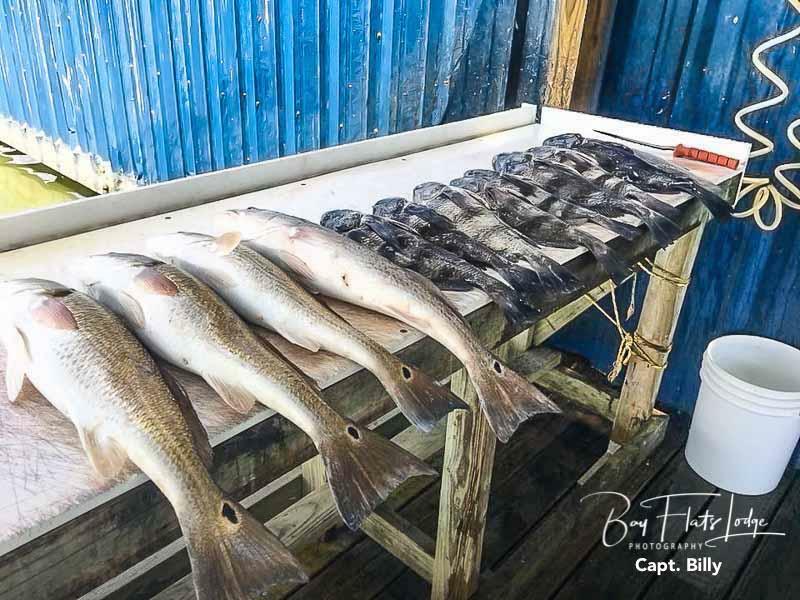 I’m glad it worked – the gang managed 12 Reds, 14 Cats, and 9 Black Drum. It turned out being a wonderful day! Capt. Billy Freudensprung – This morning marked the second day of fun with Mack, Ted, and James. 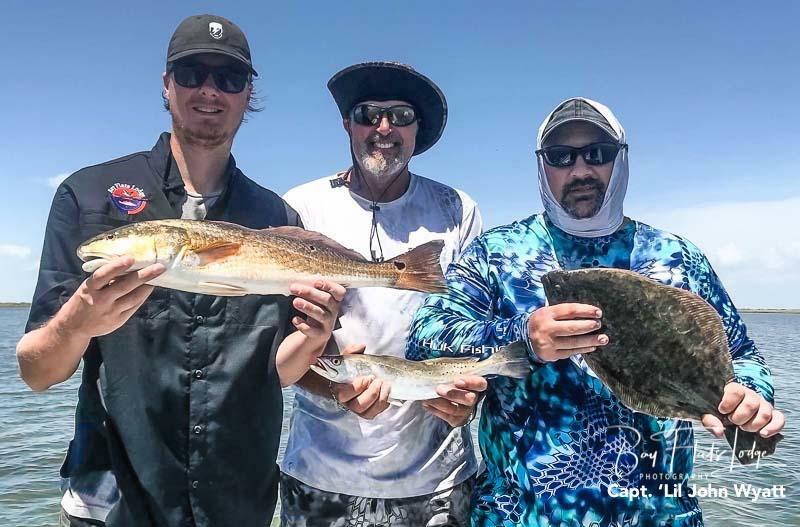 The trout have not wanted to cooperate much the past couple days, so the guys had their way with the Black Drum and one nice upper-slot Redfish. Capt. ‘Lil John Wyatt – Sunday was a great day with repeat customers from the Mike C. party. Today’s crew landed lots of fish, and they also released quite a few, as well. The guys saw a couple solid trout up to 24 and 25 inches in today’s mix, and the were very happy at the end of their trip with today’s results! The first part of the summer we were plagued by awkward winds, and although the thermometer may have climbed to record highs during that time, it didn’t seem to be brutally hot because of the heavy breeze. The winds have since dropped a bit, at least during the morning hours, and the days of August have really begun to heat up. A lot of us may think it would be difficult to locate the bite in such harsh heat conditions, but so far, the fish are hanging in there. 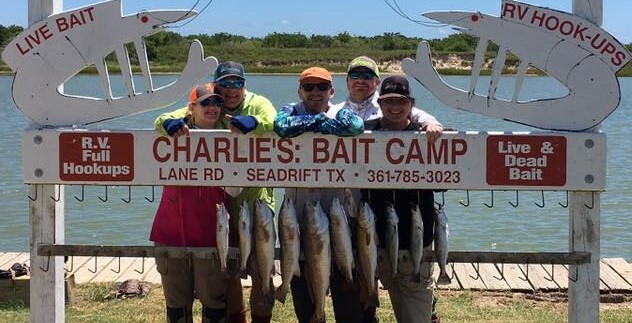 During the first part of the summer when we had daily high winds, the bite often seemed hard to come by, but today’s heat doesn’t appear to have effected the fishing too much yet. In fact, daily catches of both trout and redfish are almost becoming predictable. In the absence of disturbing winds, a lot of common fishing ground has once again opened up. Muddy waters have cleansed themselves to the degree that they now offer the greener opportunities that everyone has been waiting for all summer, and in areas that haven’t been fishable for quite some time. 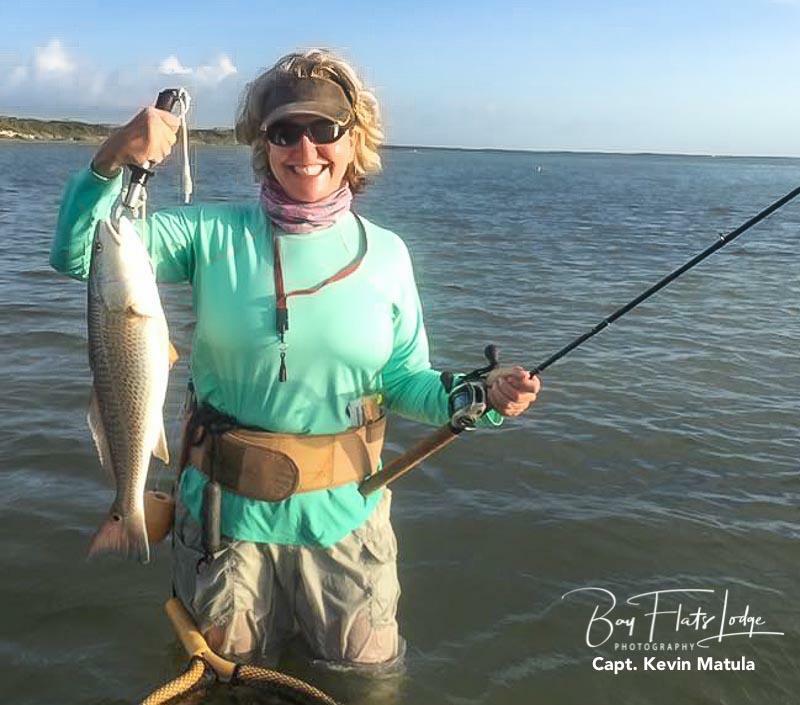 Favored shell pads out in San Antonio Bay and area shorelines where fishing had been all but shut down are now, for the most part, back on the itinerary for wade fishermen. Morning hours have remained generally calm, but the winds do still tend to build in the afternoon. So, if you’re an avid shoreline wader, you should probably try to get to your favorite spot early. It will be cooler in the morning, and you should be able to get in a few hours of prime fishing before the heat generates a lot of wind. Exposed shorelines typically begin to produce good numbers in August, so make it a point to locate shoreline areas made up of submerged grass beds – the grass does a fabulous job of filtering sediment quite rapidly, and these areas will tend to hold clear water when the rest of the shoreline remains muddy. Each group experiences were really great! This is a proactive way to spend some time with the family and friends. It’s really good to know the important insights about high temp fishing, too. I had a great time reading it and can hardly wait for my next fishing trip.